The UGG Australia ear muffs are more than meets the eyethey double as headphones and will play tunes from your cell phone or any other MP3 device and still keep your ears warm. 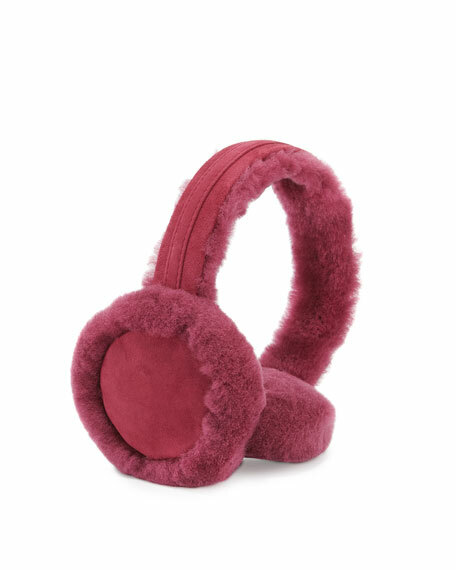 Suede headphone-wired muffs by Ugg Australia. Dyed sheep shearling (Spain/China/Australia), 100% UGGpure wool, or mixed sheep shearling and UGGpure wool sections. Comes with an 1/8 inch audio jack and a hands-free microphone. Comes in UGG Australia gift box. For in-store inquiries, use sku #175189.